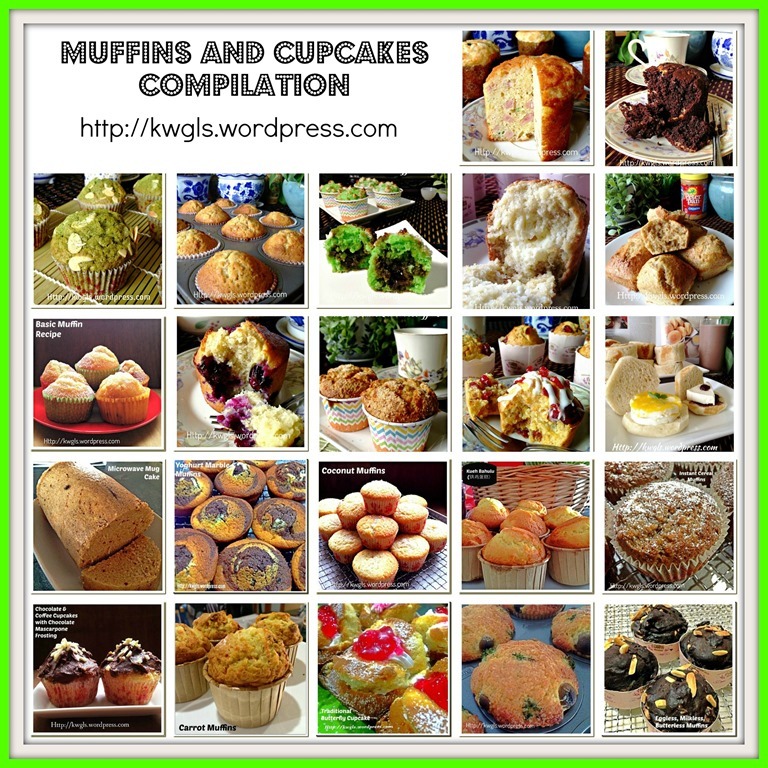 This is a special compilation of my cupcakes or muffins. Note that I have used cupcakes and muffins interchangeably because there is only a thin line between these two. Muffin preparation are usually fast, mix and bake with much lower fats contents. On the other hand, cupcakes generally have a much higher fat contents, with more complicated method (like creaming method, egg separation method) of preparation. Since most of my recipes fall into a mixture of these two broad categorizations, I have therefore decided to use it interchangeably in this post. Most of these muffin and cup cakes are easy to prepare and suitable for breakfast. As far as I am concerned, frosting is totally optional for Asian taste, what we need is more of some type of bakes that are easy, fast and practical. Of course, I shall start with this basic muffin recipe. This recipe, as far as I am concerned, is the fundamental of most of my bakes. I can be rather fast in preparing these muffins because I can remember this simple recipe. I will then tailor to the ingredients that I have at home. Even more basic recipe will be one portion of sugar, eggs, self raising flour, butters or other types of fats, plus 0.5-1 portion of milk will provide you a moist cake/muffin. Don’t doubt this, it works well as this falls back to the traditional pound cake recipe. 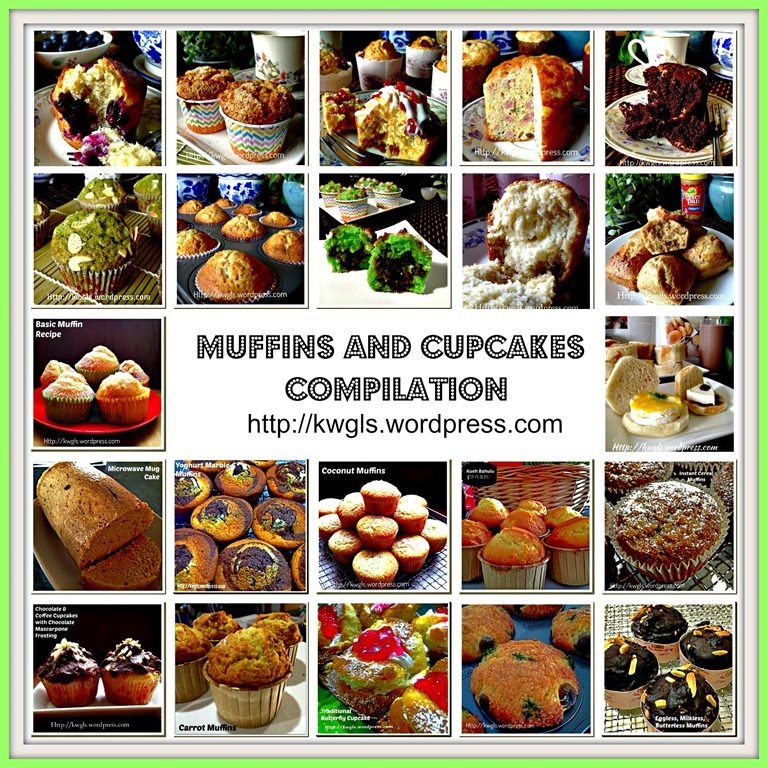 Just memorize this and you will be able to design your own recipe for cupcakes or muffins. Peanut Butter Muffins (Mix and Bake) – Peanut butter, being a type of fat can also be used to prepare your muffins. My kids help me to prepare it and from here you will know how simple is the muffin. 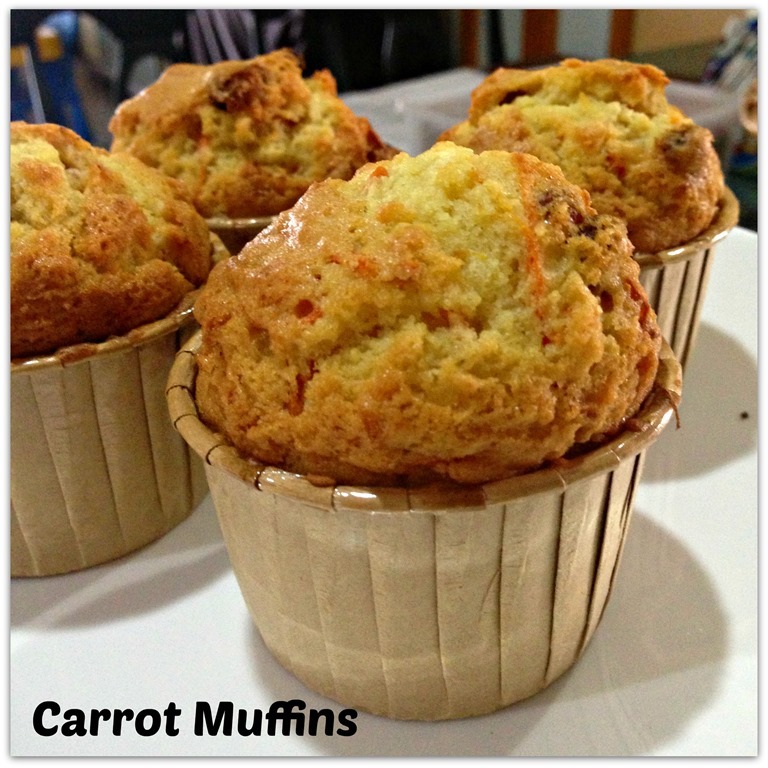 Carrot Muffins (Mix and Bake) – Another simple carrot muffin recipe that you have to try, it can be easily transformed to carrot cake if you want . 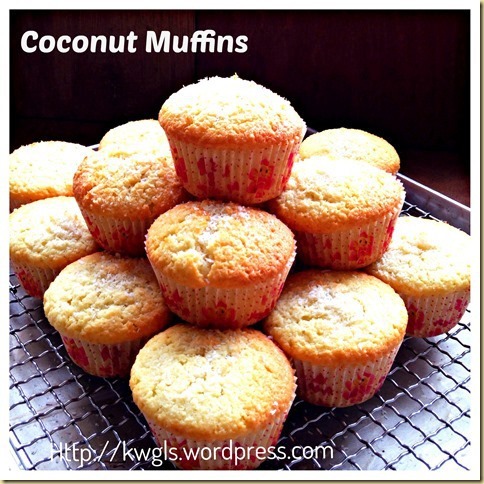 Coconut Muffins (Mix and Bake) – A moist muffin that I liked very much, should give it a try as a change if you like coconut flavour bakes. Banana Cream Cheese Cupcake (Mix and Bake) – The old recipe (2) the banana render the muffins very moist and make the cream cheese goes well with it. Instant Cereal Chocolate Cupcake (Mix and Bake) – Lack of type of ingredients at home and what what to bake, try this instant cereal muffins. You can always substitute instant cereal or instant breakfast beverages of your choice. Healthy Vegetable Muffins (Mix and Bake) – This vegetable healthy muffin is prepared using olive oil. Kids don’t want to eat vegetable, why not try this? Red Velvet Cupcake with White Chocolate Frosting (Mix and Bake) – Going to party? Try this .. not really for breakfast but it will impress your guest with this special white chocolate frostings. Yoghurt Marble Cupcake (Creaming) – The use of yoghurt have enhance the texture of the cupcake and it is a moist and finer cupcake as compared to other muffins. Traditional Butterfly Cupcake (Mixing) – A traditional cake using mixing method meaning put all ingredients together, mix well and bake. Creaming is optional but taste is awesome. This should be one of the faster but you must wash your mixer. Coffee and Chocolate Cupcake with Mascarpone Chocolate Frosting (咖啡巧克力杯子蛋糕) (Mixing) – Another traditional mixing cake. The mascarpone frosting is definitely different from those normal frosting. If you do not want frosting, just transform it into normal cake. Cupcake Sponge Cake/Kueh Bahulu (烤杯子鸡蛋糕）(Whisking) – You like kueh bahulu or baked sponge cake? You should try this. If you want full egg aroma, use cooking oil. If you want it taste like French madeleine, add butter instead. A very suitable breakfast item. English Muffins (Proofing) – A totally different type of muffins, English muffin. It is just like a bread and can be either be oven baked or pan fried. Eggless, Butter less and Milk less Chocolate Cupcake (Mix and Bake) – If you want a pure vegetarian cupcake, try this cupcake which is milk less, butter less and eggless cupcake. Taste is equally good but slightly denser than most other type of cupcake. Microwave Mug Cake (Mixing) – If you are game enough, do try this less than 5 minutes microwave mug cake. It is a quick and delicious cake. As contrast to a baked cake, it is moister as not much water vapour is lost. This entry was posted in Cakes and cookies, Food Preparation Series and tagged 8, cupcakes, GUAI SHU SHU, Guaishushu, kenneth goh, Muffins, postaday. Bookmark the permalink.